Jose Says That His New Mexico '63 Impala Was Done "My Way." At one time, Jose Ted Garcia owned a ’78 Ford pickup that was well known on the New Mexico lowrider scene, taking numerous awards anywhere and everywhere that he showed up. Even though the truck was a perpetual award winner, Jose always knew that a real lowrider needed to be an early year Chevy Impala, so he went on a search and found out that one of his friends had a ’63 Impala that he was trying to get rid of. Juan remembers going to his homie’s house late at night and checking out the car with a flashlight in the middle of a field. He noticed that the body was off of the frame, the front clip was gone, there was no sight of the interior and the trunk wouldn’t even close because it was full of extra parts, nuts and bolts, and a few unexplained nests. The following day, the car was dragged out in pieces and taken home. The car soon became a new member of the Garcia familia and started to take shape. Now an administrator with the city of Espanola, New Mexico, Jose was once a body shop man and worked for a Ford dealership as a painter, so he used those skills on his new toy. As it turned out, Jose did most of the work on the car himself, from the body and paint to the engine, hydraulic setup, sound system and even the frame. 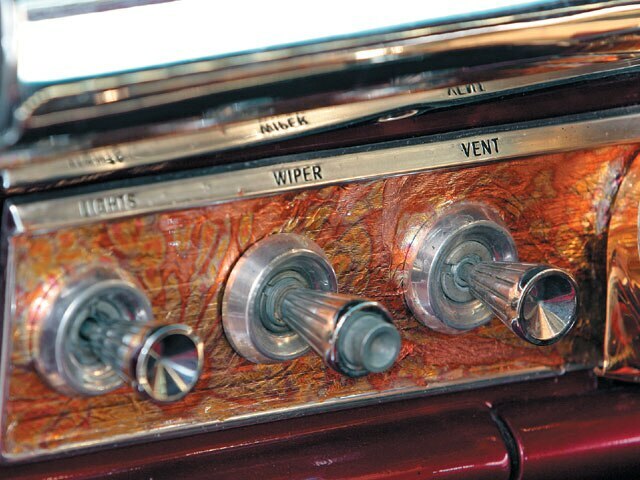 Jose’s ’63 almost didn’t make it to the 2006 Denver, Colorado, Lowrider Tour show. The hydros were finished on Friday before the show and the murals weren’t dry until later that night. Jose also didn’t get the trunk molded until the night before the car was to be photographed for the magazine. Talk about making it at the last minute! But this car was built in just three months, so we’ll give him a break. 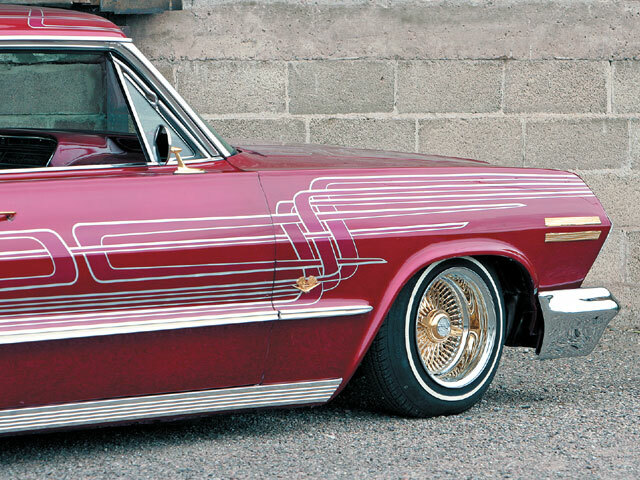 “A Mi Manera” (“My Way”) is the latest chapter in Jose’s life as a lowrider, which began back in the day when his older cousins all had ranflas and all you needed to be a proud lowrider was a nice paint job, some hydros and a decent sound system. Jose would like to thank his wife, Ana, and their kids for allowing him to turn his hobby into a lifetime infatuation. He would also like to thank his fellow Rollerz Only C.C. members for always helping out, especially Butch and Maggie. 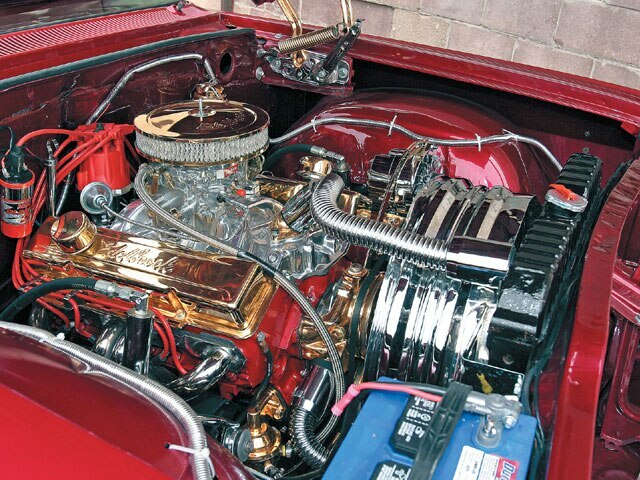 Engine/Drivetrain: Jose replaced the missing engine with an ’85 Chevy 350-c.i.d. V-8. The block was candy painted to match the car and accessorized with lots of chrome and gold-plated accents. Body/Paint: Jose straightened the body before he laid down a gold basecoat and covered with House of Kolor candy violet paint with silver striping. The car was then “tatted up” with a mural done by Eric Trujillo from Eric’s Custom Paint in Chimayo, New Mexico. Interior: The upholstery was just about the only thing that Jose didn’t do himself. 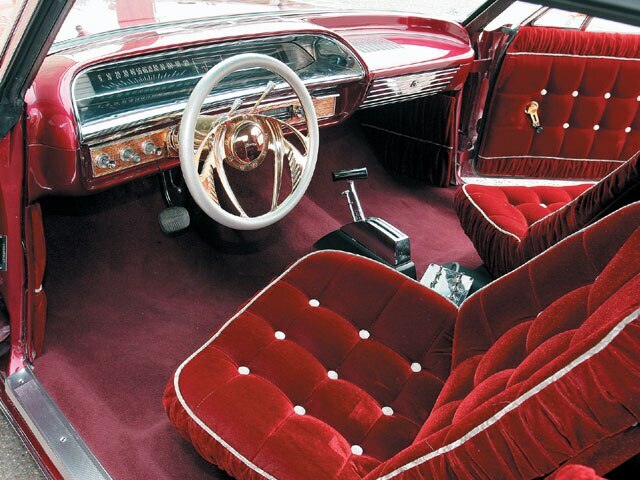 He sent the car to expert upholsterer Steve Montoya in Bernalillo, New Mexico, who did a custom biscuit-tuck interior in shades of red to match the body. Sound System: A Sony head unit was connected to a 1,600-watt amp that sends power to 4×5 mids and two 12-inch woofers. Setup: The trunk setup and custom molding were also built by Jose and finished just one day before our photo shoot. 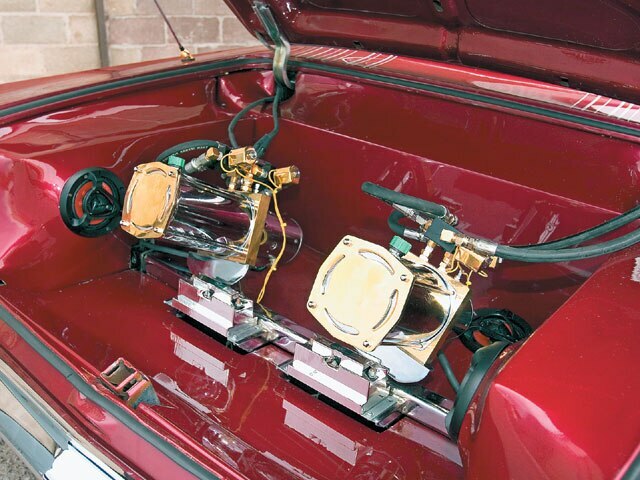 The trunk houses two custom plated Red’s Hydraulics pumps, while the car wears 3.5-ton springs all around with 8-inch cylinders up front and 10-inch in the rear. The setup’s controlled by 10 switches and powered by six batteries. The frame was boxed for reinforcement and painted.